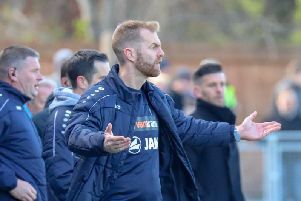 Harrogate Town manager Simon Weaver praised his side's mental strength after they snatched victory from the jaws of defeat at Dover Athletic on Saturday. The men from Wetherby Road led until the closing stages courtesy of Mark Beck's early strike, though two goals in the space of as many minutes saw the game turned on its head. Beck then bagged a second in the 84th minute to level matters at 2-2 before George Thomson wrapped up the spoils and a fine comeback with a stunning stoppage-time finish. "I'm just pleased to come out of it with a really important three points," Weaver reflected. "The mentality was absolutely superb in terms of finding a way to win. "There's no doubt we were looking fragile at one point, and actually we looked tired, which is not like us. "It was difficult, but to turn it around speaks volumes about the team spirit. "Of course we can analyse the performance on where we can improve, but sometimes it's just important to win ugly. "It's three points at the end of the day and it's great for momentum. "We've got to take huge positives and a lot of confidence because if we can step up now in terms of performance then hopefully we can go on a really good run." The match was just seven minutes old when Jack Emmett got down the right and crossed for Beck to turn the ball in at the near post. Kevin Lokko thought he had headed Dover level after 24 minutes only to see his effort chalked off for offside. Jai Reason then got in behind the Harrogate back-four, though James Belshaw was quickly off his line and did enough to put the Whites striker off. The second period saw Town indebted to Belshaw again as their goalkeeper denied Inih Effiong one-on-one, then spread himself to somehow keep out substitute Alfie Pavey when he looked certain to score. Ryan Fallowfield was next to the rescue, sliding in and making a superb last-ditch block to thwart Effiong, but the Athletic pressure did eventually pay off. It was Jamie Allen who drew the sides level, turning neatly and firing in a 79th-minute equaliser following a long throw-in into the visitors' box. Dover were ahead moments later, Town initially clearing the danger following another long throw, however the ball only made it as far as Reason who curled home a fine effort. Undeterred, the men from Wetherby Road came again and debutant Dylan Mottley-Henry found fellow substitute Aaron Williams, who crossed for Beck to again do the business at the near post. Then, two minutes into stoppage-time, Thomson cut in off the left wing and drilled into the far corner of the Dover goal from almost 30 yards out to win the contest in style. Victory lifts Weaver's men one place to seventh above Gateshead and back into a play-off berth.